The Whole House UV has a flow rate of 8 GPM ( gallons per minute), comes as a complete system fully assembled and with the required removal wrench for filter and lamp replacement. 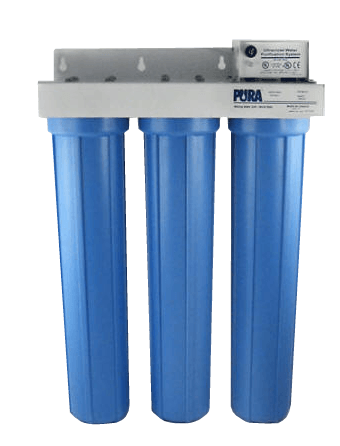 The MineralPRO three-stage Ultraviolet(UV) Water Disinfection System is designed for whole home use, providing filtered and purified water throughout your entire home to ensure that not only your drinking water is safe from many pollutants and micro-organisms, but that your cooking and bathing water is also purified. The system includes a pre-filter for sediment removal down to 5 micron and to extend the life of the carbon filter. The carbon stage filters harmful chemicals like chlorine, organic matter, VOC’s, pesticides, herbicides, benzene, PCE and more. The Ultraviolet lamp has a kill rate of 99.99% for micro-organisms including Bacteria and Viruses sometimes found in water supplies.